Preheat oven to 350 degrees F. Grease two 8 ½ by 4 ½ inch loaf pans. Dust with flour. Mash the bananas with a fork or potato masher and set aside. They should still be slightly lumpy. In a mixing bowl, using a rubber scraper or large mixing spoon, mix together the shortening and sugar so that it is like a gritty paste. If using vanilla, add that too. Add the eggs, one at a time, beating with the scraper (or spoon) until mixed. 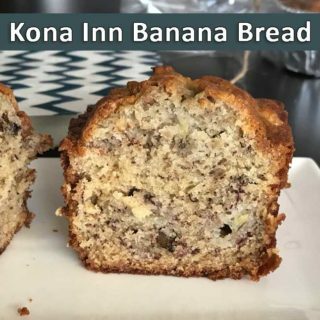 Mix in bananas, then add the nuts if using. Using the rubber scraper, fold in the flour mixture and stir until fully blended, then stir in the walnuts. Divide batter between the pans and spread evenly. Bake at 350 degrees for about 1 hour or until fully cooked. You can divide this batter among 6 smaller loaf pans (around 3x5) if you prefer. Small loaves should take about 45 minutes.